Today’s diagnostic imaging technology provides an amazing breadth of information in a wide variety of ways. However, analyzing it, compiling what’s relevant, and reporting your findings can put a serious crimp in your workflow, causing your operating costs to soar, and possibly even affecting your diagnostic confidence. VolumeShare 7 offers an elegant solution to your workflow challenges. 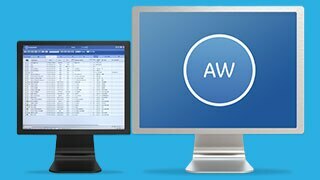 AW VolumeShare 7 is a multi-modality image review, comparison, and processing workstation with simplicity and power at its core. This workstation features 64-bit technology that allows processing of up to 5K images in a single dataset. With significant improvements in workflow processes and clinical features that will increase your productivity, AW VolumeShare 7 can elevate your practice to a whole new level. The Postfetch tool retrieves historical exams for comparison. Preference Sharing enables exchange of settings and protocols among users. The Key Images feature allows you to flag images and create key objects. Tracks how often applications licenses are used and by whom. Supports remote updates and software downloads. Simple drag and drop action for networking, media interchange, and filming. Enterprise Authentication with Microsoft Active Directory* (2000, 2003) and Novell* eDirectory (v 8.7.3) for security. Patient list to manage images from local workstation or remote systems. Postfetch feature, designed to optimize your reading workflow by automatically gathering a patient’s prior exams according to your pre-set criteria. End Review automates routine filming and networking tasks with just one click. Search Advantage for fast and easy search of a patient’s exam history on PACS or any other DICOM-compliant device. Enhanced Quick Filters of the Patient List filters studies by Modality, Date, End Review status or Exam Description. 2D Viewer for image display, manipulation, annotation, review. Integrated Filmer with enhanced flexibility to perform all filming and data exporting tasks. Access to a wide variety of applications for greater diagnostic flexibility. AW VolumeShare 7 complies with a wide variety of industry standards to facilitate adoption of features and performance improvements as the computing and medical imaging industry evolves. DICOM Print (Color and B&W). DICOM Media Interchange (CD-R, DVD+R(W)). DICOM Print (Color and B&W) and Adobe Postscript (Color and B&W) for supported printers. Safety: UL1950, CSA 950, TUV EN 60950. 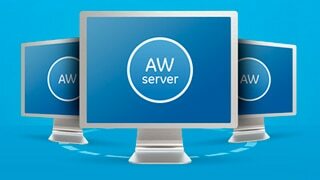 AW Server is a medical software system that allows multiple users to remotely access AW applications from compatible computers on a network. The system allows networking, selection, processing and filming of multimodality DICOM images. Both the client and server software are only for use with off the shelf hardware technology that meets defined minimum specifications. The device is not intended for diagnosis of mammography images. The device is not intended for diagnosis of lossy compressed images. For other images, trained physicians may use the images as a basis for diagnosis upon ensuring that monitor quality, ambient light conditions and image compression ratios are consistent with clinical application.